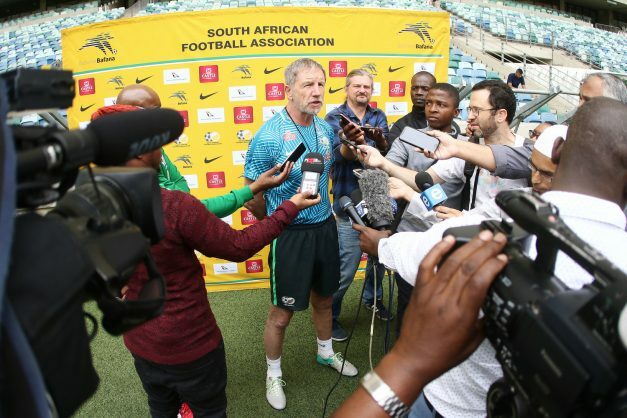 Baxter did admit that his side must not make the same mistakes they made against Cape Verde in Durban, if they are to succeed against Libya. It is almost exactly a year ago that Stuart Baxter walked into post-match press conference at Moses Mabhida Stadium, a picture of incandescent rage after his side’s World Cup 2018 ambitions had all-but imploded with a 2-1 loss at home to the Cape Verde Islands. Today, Bafana Bafana are back in Durban, at the same venue, and again they are facing an opponent most would expect them to beat, as they take on Libya in a 2019 Caf Africa Cup of Nations qualifier. The picture in terms of qualifying for Cameroon 2019 is bright for Bafana, after winning their opening qualifier in Nigeria in June of last year. And yet, if Bafana cannot beat Libya, the spotlight on Baxter’s position is only likely to intensify. “Against Cape Verde, we go a goal down and our reaction is a bit rabbit in the headlights, that is what we have to avoid. We have to make sure we play for 90 minutes. There are no unfancied teams anymore,” said the Bafana coach.